Over the years here I have found that most people realize the real Disney magic is delivered by Cast Members. That is not to minimize the amazing details produced by Disney Imagineers that delight us as we take in all that Walt Disney World has to offer! But it is often an interaction with a Cast Member that stays with us as a magical moment which we take home and treasure. Whether it be how they ALL seem to notice and comment on our special celebration buttons, how the CM speaking to a child calms their apprehension, or being chosen to go in the back door to an attraction to board immediately. 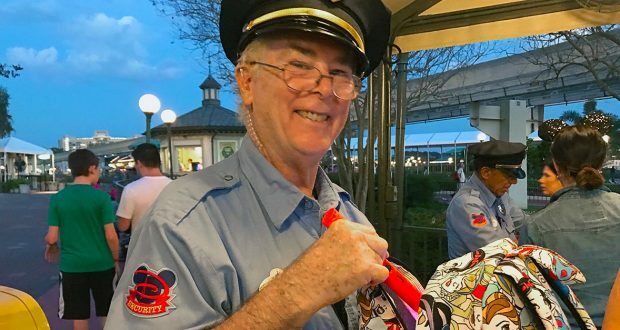 CM’s bring much magic into the days of guests at all of the Disney parks all over the world. We happen to think the 65,000 Cast Member’s at Walt Disney World are among the very best! Here is a list of suggestions if you would like to thank them in a special way. If it is something you really want them to have be persistent in offering it. You will have to offer it several times, if it is of monetary value, before they can even consider it. They cannot accept gifts of food/beverages. Listening to them when they speak to you. This seems like a courteous thing for anyone who is a “guest” would do, but many people tune them out. This includes listening to the CM’s on the parking lot tram who give you a wealth of information and tips just driving you from your car to the park entrance/transportation hub. Another reason to listen to the CM is your safety may depend on you paying attention and following their directions. Keeping your party together so the line moves smoothly. Keeping their attraction operating smoothly, efficiently, and safely is very important to the Cast Members. Know how many are in your total party and stay together in line. The first person needs to know how many of you there are and speak that to the CM loading the ride vehicles. Don’t say 3 if there are 14 of you, because that misinformation could have you riding on several different ride vehicles instead of together. Trust them to put you on the ride vehicles correctly and go to the space they direct you to for boarding. If you decide to change that on your own it will slow the whole process down and you may be separated from the rest of your party. CM’s are extremely grateful to not be run over by ECV’s or strollers. There have been several CM’s feet crushed by a guest running over them with their ECV. This has led to lost work hours/lost wages, extensive rehab, some even loss of their feet. Please be cautious and patient when approaching a CM on an ECV, and of course around all the guests of the park. Keep your speed on the lower setting, please, this will avoid many accidents. Both other guests and CM’s will much appreciate this from you. Some of the strollers, laden down with bags, multiple kids, etc., can be harmful as well, so please pay attention to the speed and direction you go. Talking nicely to them. You would be surprised how much this encourages them. Also, please, do not touch them in any way. Some have been the victim of angry guests who found it acceptable to put their hands on them in anger. They are good human beings and respond to respect and kindness. If you become angry and start demanding your own way or put your hands on them in any way there is nothing else they can do for you except call a coordinator or manager. Talking nicely is also listed in the General Rules you agree to when purchasing a ticket to Walt Disney World. Any touching of a CM is strictly prohibited. Write a Letter or Stop by Guest Relations and tell them about your great experiences with any specific Cast Member. Or you can write an Applause-a-Gram at Guest Relations that is feedback given through a manager to a Cast Member. This is not something CM’s will ask you to do, but it is a way you can do something nice for them. Just saying “Thank You” and meaning it goes a long, long, way. I have asked many Cast Members this question and this is the first answer they gave. Thank you Walt Disney World Cast Members for ALL the magic you bring to our vacations!